(MENAFN - Gulf Times) Doha Bank has entered into an agreement with Global IME Bank, one of the leading commercial banks in Nepal, for remittance of funds from Qatar to the Himalayan country. The signing ceremony was held during the opening of Doha Bank's representative office at Kathmandu, Nepal recently. 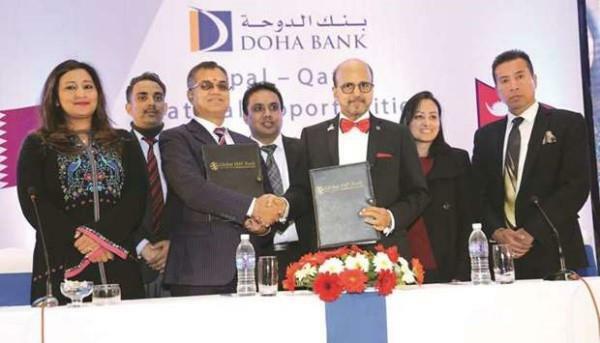 The agreement was signed by Doha Bank chief executive officer Dr R Seetharaman and Janak Sharma Poudyal, Global IME Bank's CEO. Seetharaman said 'The arrangements will help the Nepalese nationals working in Qatar to remit money to Nepal. This facility will be available through internet banking and Doha Bank's mobile app. The customer will be able to remit money online in a safe, secured and fast mode, thereby enhancing convenience and customer experience. Seetharaman said Doha Bank offered international money transfer facility to more than 200 countries through mobile banking app and direct online remittance facility to many countries like India, Philippines, Indonesia, Lebanon, Turkey, Pakistan, Bangladesh and Sri Lanka along with Nepal. 'This is the most convenient and a fast mode of remittance for expatriate community living in Qatar, the Doha Bank CEO said. Poudyal said this tie-up will benefit the Nepalese community to meet all their banking requirements in Qatar and help them to remit money in the most convenient way to Nepal through Doha Bank. Global IME Bank will help the Nepalese community in Doha to open accounts in Nepal to facilitate the banking needs in home country.